Here my horse, Tanna. His name is Santana, but I call him Tanna for short. 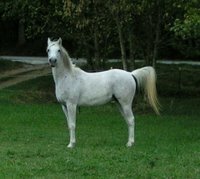 He is a 12-year-old grade Arabian gelding. Grade just means he doesn't have papers, but believe me, he's all Arabian! He is my endurance horse and a great friend. We've been partners for over 5 years and have over 600 endurance miles in AERC competitions.